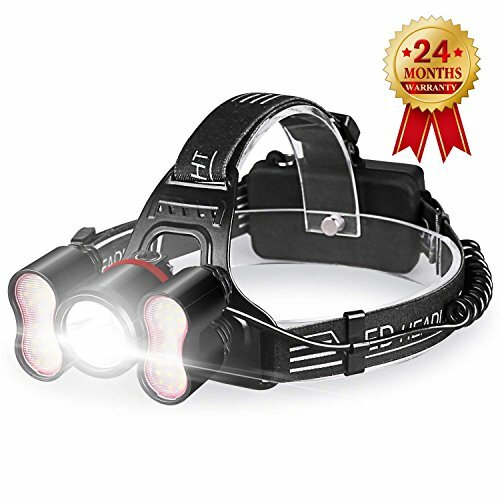 5000 Lumens Rechargeable Headlamp is ideal for Camping, adventure racing, professional use, Kennel research, mountain climbing, Hunting, Caving, mountain biking, walking, fishing or even in an emergency at home or work. - Multiple Modes: High Mode(1*T6),Low Mode(1*T6),High Mode(40*2835 LEDs),High Mode(T6+40*2835 LEDs) ,Low Mode(T6+40*2835 LEDs) and Strobe Mode,meet the needs of various types of work. - Easy to us: Single button controls all modes. - Ultra-Bright Streamlight Headlamp: 5000 Lumens,1*CREE LED and 40*2835 LED bulb,give you the brightest illumination. - High Waterproof Performance: Can be used in rain and snow weather, (not recommended for use as a diving fixture and please don't directly put it into water). - Rechargeable and Long battery life:: Powered by 2*3.7V 2200mAh 18650 rechargeable batteries.With USB cable and power adapter included, you can use it more convenient; Up to 8 -10 hours working time under full charge, don't worry that batteries are soon used up when going out. 【ULTRA-BRIGHT】1*CREE LED and 40*2835 LED bulbs deliver powerful 5000 lumen to give you the brightest illumination. Wide irradiation allow you to clearly see the surrounding environment so that make sure you stay away from danger. 【SELECTABLE MODES】High Mode(1*T6), High Mode(40*2835 LED), High Mode(T6+40*2835 LED), and Strobe Mode (T6+40*2835 LED), offer different brightness to meet your various need. Strobe Mode will quickly help you get attention without delay. 【RECHARGEABLE & LONG-LIFE BATTERY】Powered by 2*3.7V 18650 rechargeable batteries (2200mAh), up to 8 -10 hours working time under full charge. And the USB cable and power adapter is included! 【90 DEGREES ADJUSTABLE】The front light can be rotated to 0-90 degrees, more convenient and flexible to control of lighting position. Hands-free, Stretch Headband make it easy and comfortable to wear. 【HIGH WATERPROOF PERFORMANCE & MULTI-PURPOSE】Can non-stop to work in any condition that's in moisture or humidity, even in a rainy day(not recommended for use as a diving fixture). Perfect for hiking, camping, climbing, caving, barbecuing, fishing, night ride, and daily emergency field survival. If you have any questions about this product by STCT Street Cat, contact us by completing and submitting the form below. If you are looking for a specif part number, please include it with your message.